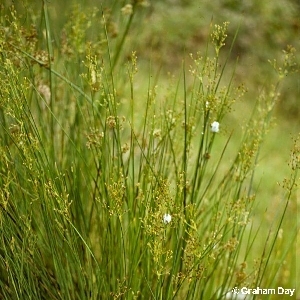 A common native perennial species of acid moor, wet pasture and swampy woodland. It grows stiffly erect up to about 3 feet tall, the leaves straight, smooth and circular in section, hollow, with transverse septa so that the leaf feels jointed when run between the fingers. The flowers are small and brownish in colour; fruit a sharply pointed capsule. All names: Juncus acutiflorus Ehrh. ex Hoffm. ; Juncus sylvaticus auct.